Got married? Are you planning to bring your spouse along with you abroad? Everyone wishes to take their spouse along with them if they are residing abroad. However, almost many of them are not aware of the rules and regulations abroad. There are some procedures related to it. A marriage certificate is not enough to bring your spouse along with you abroad. Marriage certificate attestation is essential for finishing the rigid procedures of family visa. The life we are having today is more organized than it was earlier. This is because of advancement of technology that it made easy and accurate in nature. So, all aspects of life have to adhere to certain common standards and protocols. This is true for all the sectors including travel, immigration, academic, and employment. This is also extended to legal policies followed in different nations and in acquiring properties like real estates. Documentation with acknowledged standards has began to be mandatory in every stream. And these documents require something more to become valid and credible. This is meant by the attestation of certificates. Attestation is an official procedure that addresses proper acknowledgement of concerned authorities. This validates the originality of the document which can be either an educational certificate, a travel document which is meant for overseas travel or document that establishes the valid identity of a person. If you are trying to apply for a family visa in a foreign country, then attestation of your marriage certificate is necessary. It should be attested in the country of origin where the wedding was solemnized and later you have to attest the certificate by the nation where you are going to apply for the family visa. Like any other attestation procedure, for getting the family visa in foreign nations, attestation of the marriage certificate is a vital element to prove the validity of the marriage and stating that it is not void. Different nations have different rules and regulations. In some countries, there may be some restrictions for applying for different visas. In UAE, one should have a salary scale of AED 4000 to become eligible for applying for a family visa. HRD or Human Resources Development Attestation is the very first phase in the attestation of marriage. You have to furnish your marriage certificate with the HRD department of the concerned state, from where it is originated for verification. They will then verify your certificates and then starts with the attestation process. Almost every state have the same procedure for HRD attestation, but the label for the same may be different across the nation. MEA attestation is undertaken by the Ministry of External Affairs. Ministry of External Affairs provides two different kinds of document attestation. Marriage attestation also has this category difference. They are Ministry of External Affairs attestation and Apostille marriage certificate attestation. Apostille Marriage Certificate Attestation: If the nation where you are aspiring to travel is a member country of Hague convention, then you are required to get an Apostille stamp attestation in your certificate of marriage. 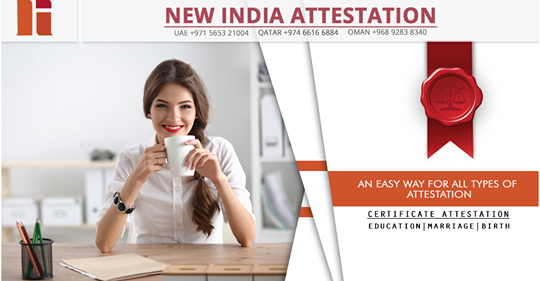 MEA Attestation: It is undertaken as per the usual attestation procedure. You are just required to submit your certificate for authentication and it will be then duly attested by Ministry of External Affairs after valid verification. After completing the Human Resource Development and Ministry of External Affairs attestation process, the marriage certificate is then furnished with the embassy or consulate of the destination country to where you are planning to go. The Embassy will then attest your marriage certificate after valid verification. The first and foremost things you have to care about is the agency with whom you make your attestation to be done. Why New India Attestation Services? New India provides you with unmatched service. When you give us the responsibility of collecting your documents, you will be ensured with high quality services. With a strong and committed team, we are able to understand the needs of our client and match it with our applicable standards. We strongly believe in the satisfaction of our customers. We provide cost-effective consistent service with a commitment towards high business standards. We are working with a warm vision to avail the perfect solution for your certificate attestation formalities. We have a facility for online tracking. We inform our clients about the current position of the process being done by sending emails promptly regarding the latest updates.